Remember a while back, TC Electronics released their – rather clever – PolyTune Pedal that allowed you to see the tuning of all six of your guitar’s strings at once. Picking one string at a time is so last year. Well, now TC are porting their cleverness to the iPhone (and iPod Touch if you’ve got a mic thing attached). It’s early days yet, but the PolyTune App sounds pretty interesting. In fact, the days are so early that TC are looking for beta testers for the app. Want to be in on the ground floor? Want to see this before the common people? Want to help TC make the app perfect? Well, off you go and apply to be a beta tester. You’ll get a pre-relase copy of the app in return for providing feedback on its operation (or lack thereof). 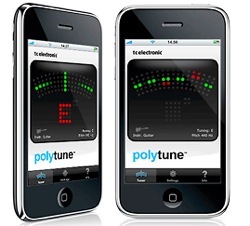 Pop to TC Electronics to apply to test PolyTune iPhone app. They’ll select 50 testers from those that apply (the exclusivity just gives more license to lord it over your friends). Opinion: How Much For The Broken Tele?